THE SKYDIVE JEWEL OF VEGAS! $50-OFF WITH PURCHASE OF MEDIA PACKAGE! Sammy and the whole Fyrosity team were amazing! Excellent customer service and was a seamless transition in the whole process! Definitely a place to sky dive! The view of Lake Mead and Valley of Fire was just beautiful! Skydive Fyrosity is the place to go if you want to skydive! Aside from experience, the professionalism, kindness, patience and pure passion for what they do is incredible. Very thorough, fun and safe. Super awesome dropzone with an even better view of the valley of fire and lake mead! I did my first skydive here and loved it so much I came back a week later and started getting licensed! Now I'm a licensed skydiver and I would highly recommend this place if you want to get licensed or if your just doing your first tandem skydive! I can't say enough great things about Sammy. His level of professionalism and commitment to excellence and safety put me at ease from the moment I first talked to him. My name is Daisy Lang. I’m a World Champion in 3 different sports - professional boxing, kick boxing and karate. Today I did my First Tandem Skydive at Skydive Fyrosity. I want to say Thank you to my Tandem instructor Sammy Vassilev, who made it very successful. I enjoyed his professionalism, knowledge, trust , great personality and motivation. Sammy inspired me to do this again. See you soon! 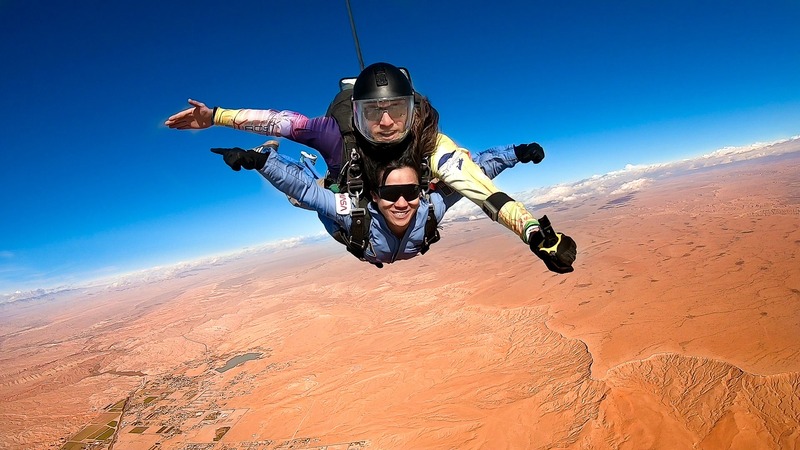 The Best Skydiving in Las Vegas with wonderful sky dive instructor Sammy and his wife Iva. They are really a beautiful couple and make you relax and treat you like a family before the jump. Good Luck Guys for your future expansions. Wow! First Tandem Skydiving experience - Amazing! Breathtaking views of the Valley of Fire and Lake Mead. Very friendly and accommodating staff. Sammy, my instructor, is awesome. His experience in skydiving, warm personality, and confidence put me at ease which made my first tandem skydiving experience the best ever! Best experience ever! I would definitely recommend this place! What a fantastic experience we had! The instructors are awesome and they take their time to go over everything and answer any questions we had. All other staff members were very friendly and welcoming. Exceptionally competent and very friendly staff, super-safe operation and you get to jump above the Valley of Fire! Sam and his staff were excellent! Was my first time jumping and they made my experience wonderful! I will be back my next visit to Vegas and I recommend him to everyone! My boyfriend and I had a great experience doing our first tandems here. Sammy makes you feel very comfortable with the whole experience. The Valley of Fire is a beautiful place to jump. 2016 - 2019 © Skydive Fyrosity® | Designed by Photographika, Inc. | Hosted by Photographika, Inc.